In a UN speech, Egypt's new president hits out at Israel over its veiled threats to attack Iran and the deadlock in the peace process. Egypt's new president on Wednesday hit out at Israel over its veiled threats to attack Iran's nuclear facilities and the deadlock in the Middle East peace process, AFP reports. President Mohammed Morsi received a rousing ovation for his first speech to the 193-member UN General Assembly since becoming Egypt's first civilian, democratically elected leader in June. Morsi said the Middle East "no longer tolerates" any country's refusal to join the nuclear Non-Proliferation Treaty "especially if this is coupled with irresponsible policies or arbitrary threats." "The acceptance by the international community of the principle of pre-emptiveness or the attempt to legitimize it is in itself a serious matter and must be firmly confronted to avoid the prevalence of the law of the jungle," Morsi said, according to AFP. Morsi also put the Israel-Arab conflict ahead of the Syria war in the list of priorities he laid out before the General Assembly. "The first issue which the world must exert all its efforts in resolving, on the basis of justice and dignity, is the Palestinian cause," Morsi said. He said that UN resolutions on the conflict had not been implemented and that Palestinian Authority Arabs "must also taste the fruits of freedom and dignity" that other countries in the Arab region have won in the past year. 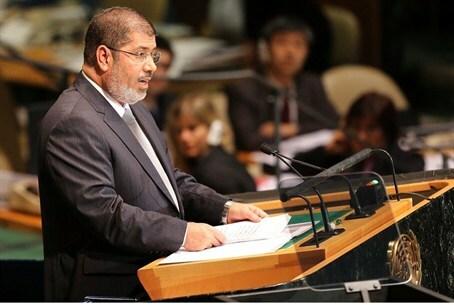 "It is shameful that the free world accepts, regardless of the justifications provided, that a member of the international community continues to deny the rights of a nation that has been longing for decades for independence," Morsi said. "It is also disgraceful that settlement activities continue on the territories of these people," he added. Prime Minister Binyamin Netanyahu and PA Chairman Mahmoud Abbas are to address the General Assembly on Thursday. Abbas has announced that he will ask the UN General Assembly to recognize a “state of Palestine” during has address. Earlier on Wednesday, Iran's President Mahmoud Ahmadinejad accused the West of nuclear "intimidation" in his final speech to the UN General Assembly. "Arms race and intimidation by nuclear weapons and weapons of mass-destruction by the hegemonic powers have become prevalent," Ahmadinejad said in a rare outburst in the rambling 35 minute speech. "Continued threat by the uncivilized Zionists to resort to military action against our great nation is a clear example of this bitter reality," he added in his only reference to Israel. U.S. President Barack Obama told the UN assembly on Tuesday that the United States will "do what we must" to prevent Iran from getting a nuclear weapon. Netanyahu addressed a letter to the citizens of Israel Wednesday just before he boarded a flight to New York. In it, he castigated the UN delegates who chose to remain in the UN General Assembly hall as Ahmadinejad spoke. "On the eve of Yom Kippur, a day that the Jewish people holds sacred, the Iranian dictator chose to call for our disappearance in public, with the entire world watching. This is a black day for those who chose to remain in the hall and hear these hateful words. In my speech before the representatives of nations at the UN General Assembly, they will hear our response,” Netanyahu wrote.